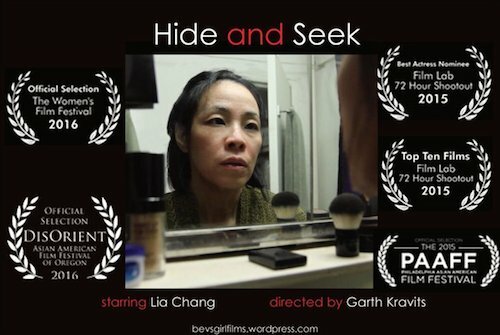 My Bev’s Girl Films partner Garth Kravits and I are delighted to have our short film, Hide and Seek as an official selection of the 2016 Chicago International Social Change Film Festival. Our Midwest Premiere screening is on Sunday, September 25, 2016, at the Showplace Icon Theatre, 150 W. Roosevelt in Chicago, IL 60608, in the A Day in Her Shoes: Gender-Based Discrimination, Violence and Other Challenges of Womanhood Program, 4:05P.M. – 5:40P.M. Click here for tickets and here more information on the festival. Other films screening: The Girl Epidemic (2), Break the Branch (74), and I Just Don’t Know (10). Co-founded by social entrepreneur Emile Cambry, Jr. and poverty law attorney Todd Belcore, the pair choose to addresses major issues and hardships around the world, with world premieres, Q&As with directors and panelists and proactive brainstorming sessions to remedy issues presented in the films. The Chicago International Social Change Film Festival (CISCFF) features eye-opening, inspiring films from all over the world that allow attendees to see stories of hope and hardship from the perspective of those dealing with them firsthand. CISCFF is also an innovative vehicle for change that allows attendees to turn their inspiration into change by providing them with access to the filmmakers, organizations and action opportunities dedicated to resolving the issues highlighted in the films featured. 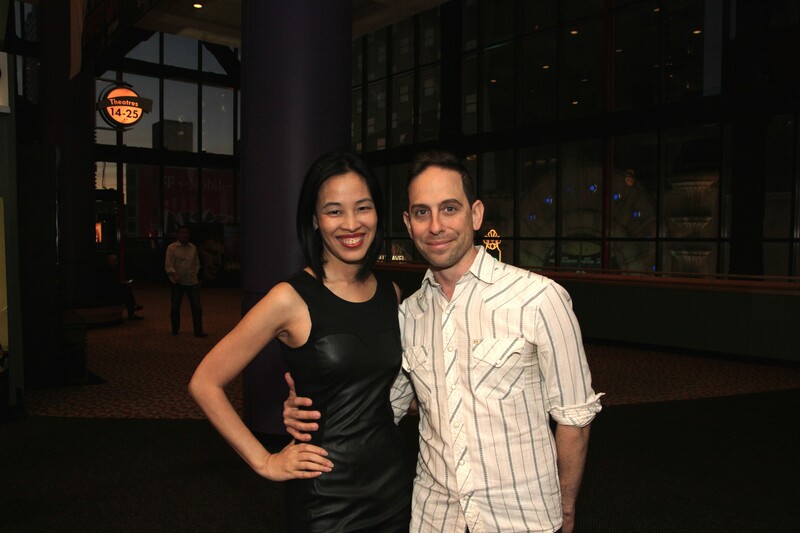 Ed Moy’s documentary short Aviatrix: The Katherine Sui Fun Cheung Story is an official selection of 2016 Long Beach International Film Festival and will have its East Coast premiere screening on Thursday, August 4, 2016, at the newly remodeled Long Beach Cinema 4, 179 East Park Avenue, Long Beach, NY 11561, from 12:30-1:30pm preceded by Spirit of Iris. Spirit of Iris is the story of a trail blazing woman, who swam in the 1936 Olympic Games in Berlin, Germany and was in one of the earliest groups of women to ferry planes for the Air Transport Command in World War II. On Sunday, Aug. 7th, the First Chinese Baptist Church is presenting a free screening of Aviatrix: The Katherine Sui Fun Cheung Story in the New York City premiere at 4:00P.M., followed by a Q&A session with the filmmaker, Ed Moy. The First Chinese Baptist Church is located at 21 Pell St. in New York. On Sunday, Aug. 14th, a short version of the Aviatrix documentary will screen in the 2016 Marina del Rey Film Festival at the Cinetransformer truck in the Marina at Jamaica Bay Inn during the festivals third shorts screening block, which begins at 4:00P.M. Director Ed Moy and Katherine’s daughter Dottie Leschenko will be in attendance for a Q&A after the end of the shorts film block. Limited to 90 seats. Tickets online. 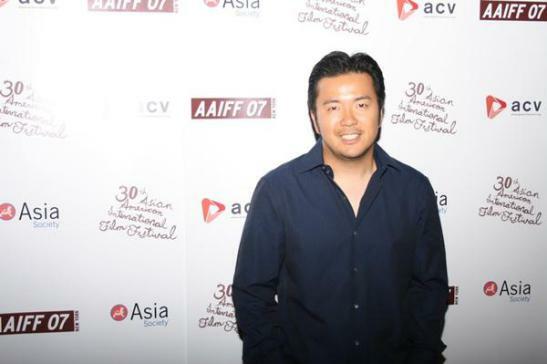 Below is a Q & A with writer/producer Ed Moy. Ninety-Nines Members Photo of Katherine Sui Fun Cheung with Ethel Sheehy courtesy of Dottie Leschenko. Lia: Were Katherine Sui Fun Cheung’s accomplishments eclipsed by Amelia Earhart’s legend? Ed: I would say that Amelia was obviously the most famous aviatrix of the 1930s. But what stands out about Katherine is she was a minority woman doing something that was seen as primarily a man’s sport at that time. It should also be pointed out that Chinese women were still looked at as docile homemakers, who worked in the kitchen, raised kids, and took care of the house. Katherine broke through all of those limiting traditional expectations during a period in history when gender equality and equal rights weren’t always given freely to minorities. Daring young women such as Katherine and Bessie Coleman (the first female pilot of African American descent) were often seen as sideshow curiosities at air circuses and county fairs around the country. In many ways, they are pioneers who deserve to be remembered for their roles in aviation history. Our goal is to share Katherine’s fun and adventurous story with a new generation that may not know about her accomplishments. Katherine Sui Fun Cheung was not the only Chinese female to get her pilot license in the 1930s. There’s some confusion on who was the first though. 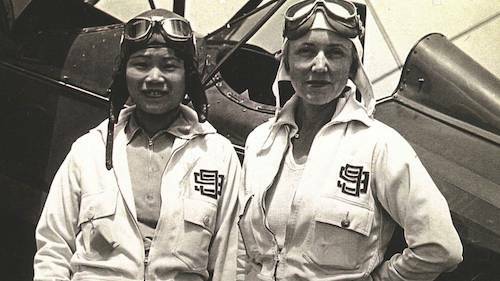 The Smithsonian’s National Air and Space Museum recognizes Katherine as the first Asian American aviatrix but others point to Hazel Ying Lee. Although both Hazel and Katherine were licensed in 1932, according to various newspaper articles from that time period, Katherine got her license in March of 1932, whereas Hazel completed her training and got her license in October of 1932. A number of other Chinese females also earned pilots license during the 1930s including Leah Hing, Rose Lok, Lee Ya-Ching and Hilda Yen. There were also several Chinese women that learned to fly but were not licensed in the early years of aviation, including Anna Low in 1918 and Frances E. Lee, who died tragically falling from a plane in 1920. We will feature a segment with Aviation historians and academics talking about these women and their accomplishments in our documentary and web series. Katherine Sui Fun Cheung and Walter Chan with biplane photo courtesy of Dottie Leschenko. Lia: In 1932, one percent of American pilots were female. What were some of the issues involved with Cheung being a pilot? 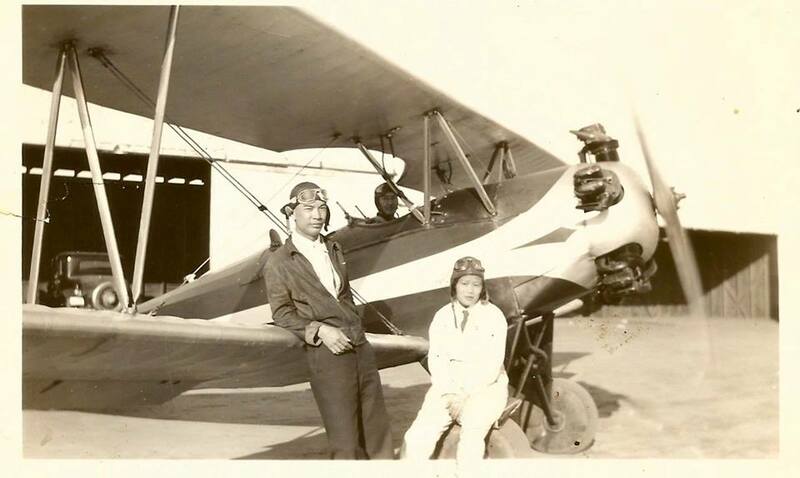 Ed: Around 1931, Katherine sought training through the Chinese Aeronautical School, which at that time had begun teaching young Chinese American men to become pilots so they could aid in the fight against Japanese invaders in China. According to family and various news articles, Katherine was not allowed to train with them at first because she was a woman. But she refused to take no for an answer and eventually paid for lessons from civilian instructors. Once she got her license Katherine did participate in the local Chinese Flying club with the other men. She was the only female member, although there was another young woman who came from a well-to-do family that helped finance the club’s activities. Later, Katherine was invited to join the 99s, an exclusive all-women flying club, whose members included Amelia Earhart. Lia: How did you discover Katherine’s story? Ed: My first exposure to an Asian Aviatrix was actually in 2007. I read about Hazel Ying Lee’s story at a Chinese History museum in Honolulu’s Chinatown. But it wasn’t until 2012, that I heard about Katherine’s story after East West Players created a Theatre for Youth production called “Taking Flight” written by Judy Soo Hoo. I had written the original script for a short film about actor Keye Luke, which filmmaker Timothy Tau later turned into his award-winning short film, which spanned the 1930s-1940s film era. Having developed an interest in that 1930s time period, when I heard about the “Taking Flight” production, it piqued my interest in Katherine’s story. 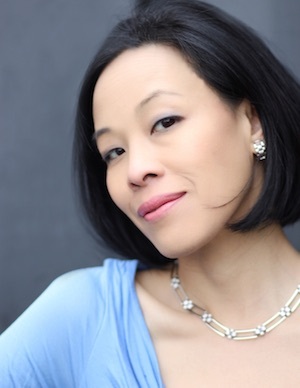 But I did not follow up again until October 2013 when I was tossing around ideas for a project with actress Katherine Park, who I originally had cast to play the young Katherine Sui Fun Cheung in dramatization scenes for the documentary. Those dramatization scenes were later shelved in favor of turning it into the animated short film Up in the Clouds. Lia: In 2004, Lucy Liu attempted to pitch a Katherine Sui Fun Cheung project to HBO with the family. How will yours finally tell Cheung’s story? Ed: At a charity luncheon in 2004, Lucy Liu did have a brief meeting with family members. According to grandson Alan Wong who was in attendance, Lucy spoke with Katherine’s granddaughter Judy Wong about pitching Katherine’s story to HBO. However, no project was ever funded and Lucy moved onto other projects. Judy unfortunately passed away last year from cancer. This was not the first attempt by filmmakers to tell Katherine’s story. Chinese actresses Luo Yan and Josephine Chien also attempted to create projects. Hazel Ying Lee documentary filmmaker Alan H. Rosenberg had also proposed making a film about Katherine and several other Asian Aviatrix of that same era. Lia: What’s the goal of your documentary? Ed: Our primary project goal is to share Katherine’s story in a fun and entertaining way. Our half-hour documentary film version will premiere at the 2016 Sacramento Asian Pacific Film Festival, and a longer form web series in the works. I also plan to add additional footage and interviews to create a one-hour television broadcast version to submit for PBS and/or online content providers, along with making a limited edition DVD with bonus material, as well as a companion photo book with biographical information. The end goal is to reach out to schools and museums with the web series and DVD in hopes that new audiences will find Katherine’s story an informative, inspiring and entertaining piece of Asian American history. Katherine was a visionary who pursued her dreams with a passion and we want to honor that with a project that reflects her legacy as a pioneering aviatrix. 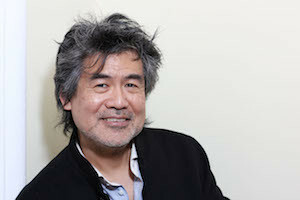 Ed Moy is an award-winning journalist. His series of feature news articles about the Leukemia & Lymphoma Society’s Team in Training fundraising programs helped raise awareness for their mission while touching the lives of thousands of readers and earned him their National Print Media Award for Excellence in Journalism. 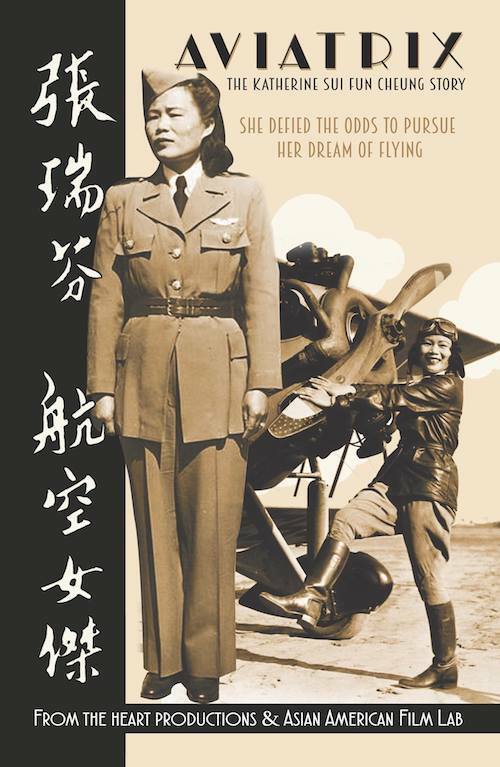 In addition to working on the Aviatrix documentary film and web series project about Chinese women aviators of the 1930, Moy was co-writer on director Timothy Tau’s award-winning short film Keye Luke about the life of pioneering Asian American actor Keye Luke. It won an Audience Award at the 2014 Hollyshorts Film Festival and was nominated for Best Short Film at the 2013 Dragon*Con Short Film Fest.